Talk about something that's shiny on the outside AND on the inside - this compact favor has it all covered! And your guests will definitely hold on to these useful treasures long after your event is through. 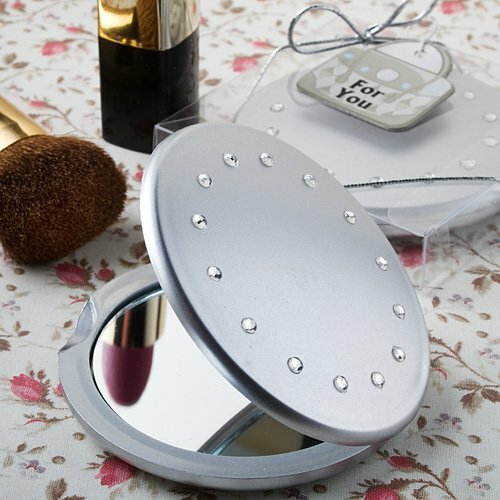 Each compact favor, from Fashioncraft's exclusive Classy Compacts Collection, measures 2½" round and has a pretty silver matte finish molded plastic outer case, brilliantly detailed with a single line of glistening rhinestones around the border, with a hinge that opens to reveal dual glass mirrors inside. Sure to add uniquely feminine flair to any event that's "for the girls," each comes in a clear acetate box, wrapped and tied with a silver metallic elastic cord and an attached purse design "For You" tag.